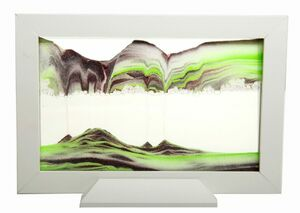 Create a different landscape every time even in the dark with the White Glow-in-the-Dark Sand Art Picture by Klaus Bosch! This one of a kind sand art piece is called the White Glowbee and is sure to transport your imagination to another dimension. Each Glow-in-the-Dark Sand Art Picture is handmade by Klaus Bosch, a native Austrian. Klaus (aka: Sandman) is known as the master of moving sand pictures worldwide. • The White Glowbee is made of beech wood and finished with a white matte finishing. Prominent sand colors are ash, white, red and green.